.... In the first classic Western, John Ford’s Stagecoach (1939), John Wayne’s Ringo Kid is the only man who treats prostitute Claire Trevor as a lady, shaming others into doing the same. In Ford’s next Western gem, My Darling Clementine (1946), Wyatt Earp (Henry Fonda) realizes Doc Holliday’s genteel ex-girlfriend, Clementine, is more vital to pacifying Tombstone than his gun. Shane and his farmer employer’s wife, Marion, never act on their growing mutual attraction, out of respect for her role of wife and mother. An older John Wayne as Sheriff John Chance in Rio Bravo (1959) gets repeatedly flummoxed by Angie Dickinson’s sexual candidness. The Magnificent Seven risk their lives, and ultimate lose four, defending a dirt poor Mexican farm village. 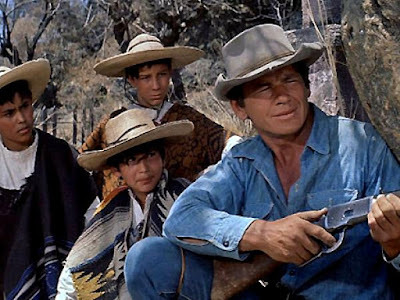 One of the seven, Charles Bronson, delivers the greatest speech about fatherhood in all of cinema, lecturing a group of hero-worshiping young boys.